The Entertainment Industry Foundation harnesses the collective power of the industry to raise awareness and fund for critical health, educational and social issues in order to make a positive impact in our community and throughout the nation. People from every facet of the entertainment community – actors and executives; guild and union members; and employees of studios, networks and talent agencies – volunteer their time, talent and services to support our work. Founded 67 years ago by Samuel Goldwyn and other Hollywood luminaries, EIF has raised millions of dollars for cancer research and prevention; diabetes awareness; education and creative arts; and other social programs. EIF's CEO Lisa Paulsen was just named one of The Nonprofit times Power & Influence Top 50, celebrating the nonprofit sector's top executives and thinkers for their impact and innovation. EIF is a 501(c)(3) tax-exempt organization that meets all 20 Better Business Bureau standards. The Entertainment Industry Foundation has mobilized the entertainment community around a groundbreaking initiative designed to inspire a new era of service and volunteerism. This multi-year campaign, called “iParticipate,” hopes to make service a part of who we are as Americans and show what we can achieve when we all pull together. As part of its launch, the four major broadcast networks - ABC, CBS, FOX and NBC - and other cable channels participated in an unprecedented, week-long television event from October 19-25, 2009, with more than 100 shows highlighting volunteerism. EIF produced a series of public service announcements that focus on key areas where volunteers are needed most. Celebrities volunteered their support including: Blythe Danner, Morgan Freeman, Faith Hill, Matthew McConaughey, Gwyneth Paltrow, Simon Baker, Emily Deschanel , Eva Longoria Parker, Julia Louis-Dreyfus, Masi Oka, Michael Strahan, Kate Walsh, and Rainn Wilson. EIF enlisted Jesse Dylan, the creative force behind Bono's "Red" campaign and "One" and will.i.am's iconic "Yes, We Can" video, to create, direct and produce the PSAs. In addition to generating heightened awareness about the value of community service, EIF will provide grants to key volunteer/service organizations to help build their capacity to accept, train and deploy volunteers in areas of the greatest need. Men and women of the entertainment industry will help fuel the drive to service not just by showing its benefits to the country, but also by bringing home its tangible benefits to the people who volunteer. The heart of America’s service movement, ServiceNation is a coalition of 200 nonprofits that cut across all walks of American life - representing community, faith-based, and national service organizations with members of all age, education and income levels - to create meaningful service opportunities and build a stronger nation through increased volunteerism. By getting involved in ServiceNation, Americans can engage in any form of service that best suits their interests, skills, and schedules. ServiceNation is providing strategic support to EIF’s iParticipate by working with its member organizations to provide quality volunteer experiences for Americans who are inspired to answer the call to serve, and by helping its member organizations promote those service opportunities and report the outcomes of their efforts. We are proud to support iParticipate’s unprecedented contribution to expand the service movement, which will bring us closer to realizing our vision of a day when a commonly asked question in America is, "Where do you serve?" An EIF grant to the UCLA Foundation helped bring about the first-ever, day-long volunteer event for new UCLA students participating in service projects spread across Los Angeles on September 22, 2009. UCLA Volunteer Day mobilized more than 5,000 students participating in restoration and beautification projects at eight locations in Los Angeles: Griffith Park, Point Dume State Beach, the VA Hospital and five local schools. City Year unites young people of all backgrounds for a year of full-time service, giving them the skills and opportunities to change the world. Over 1,500 City Year corps members in locations across America will serve more than 2.5 million hours. Each of these young leaders is making a difference by serving 1,700 hours as tutors, mentors and role models. The City Year corps members help students at-risk of dropping out stay in school and on track. Uniquely qualified to improve student attendance, behavior and coursework, members help students and schools succeed. City Year’s work in Los Angeles is made possible thanks to a $1 million capacity building grant from the Entertainment Industry Foundation, Hollywood’s leading charity and City Year’s Los Angeles’ Impact Sponsor. 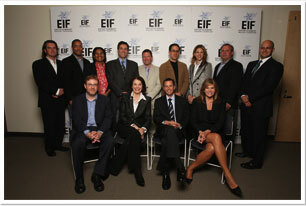 EIF's Board of Directors is comprised of top representatives from across the industry. Film studios, television networks, talent agencies, labor unions and guilds all have members on the board of EIF. Invite your Facebook friends to join! Volunteering is more fun when you do it with your friends. Click below to invite your Facebook friends to join you in doing the right thing. EIF and iParticipate are proud of the entertainment community and all of the great things they do to participate. The CAA Foundation is the philanthropic arm of Creative Artists Agency (CAA) and is and an integral part of CAA's culture. Entirely underwritten by CAA, the foundation empowers employees, artists, companies, and athletes to contribute their time, talents and resources to make a difference and to be of service. Utilizing the power and reach of the entertainment industry, the CAA Task Force is a specific group of staff that work together to create positive social change, encourage volunteerism, stimulate public awareness of important issues, and facilitate in-kind donations. Fox Gives strives to enhance the quality of life in the communities we serve both locally and globally through employee engagement and community outreach. We are committed to developing high-impact philanthropic programs that serve our youth, the environment and the underserved. The ICM Foundation, a non-profit organization, was formed in 2006 to help maximize the impact of the agency's numerous charitable activities. The primary mission of the ICM Foundation is to enrich students' lives through the arts. For over 25 years, Lifetime Networks has led the longest standing and most comprehensive public affairs efforts of any cable network. Addressing critical social issues affecting the lives of women and girls, Lifetime develops, creates and launches advocacy campaigns that involve partnerships with non-profits, women leaders, public officials and the media to reach women on-air, online and in their communities. The NBC Universal Foundation invests in educational initiatives that will help prepare children for productive futures. In 2009, the NBC Universal Foundation awarded grants focusing on public secondary education programs. NBC Universal's "The More You Know" is the longest-running, most comprehensive network public service campaign in the media landscape. For more than 30 years, NBC Universal and its parent company, GE, have supported United Way with fundraising efforts in communities large and small during its annual company campaign. In addition, our company announced a long-term commitment to support Aberdeen Canyon in the Griffith Park, in partnership with the NBCU Foundation grant organization, Los Angeles Conversation Corps (LACC), and the City of Los Angeles Recreation and Parks. Nickelodeon/MTV Networks Kids & Family Group has a 30 year legacy of empowering kids and their parents with resources to impact issues that matter to them most. Paradigm and its Chairman Sam Gores have always had a strong commitment to philanthropic causes including The Peapod Foundation which helps enrich the lives and give creative, artistic development opportunities to disadvantaged children; Best Buddies - which enhances the lives of people with intellectual disabilities by providing opportunities for integrated employment as well as the Saban L.A. Free Clinic and Cedars Sinai Hospital. Headquartered in the heart of Hollywood, Paramount Pictures has a long and proud tradition of volunteerism, with special focus on supporting public education, protecting the environment and combating HIV/AIDS. Our signature event is Viacommunity Day, an annual day of service established by parent company, Viacom, in 1995 that mobilizes our global workforce to give back to their communities. The non-profit Screen Actors Guild Foundation honors artists and their positive influence on the world around them by assisting, educating and inspiring SAG actors with free programs that enhance their career focus while encouraging them to volunteer their talents in areas of mutual support as well as community involvement. Sony Pictures Entertainment is committed to the principles of good corporate citizenship through its dedication to arts education initiatives, workforce development, environmental sustainability and celebrating diversity. Team ESPN engages in community projects worldwide - "Fans Helping Fans"®. While raising millions of dollars for The V Foundation for Cancer Research, employees work with Boys and Girls Clubs, Special Olympics, Make-A-Wish, soup kitchens, veterans, Red Cross and more. They celebrated ESPN's 30th anniversary with 30,000 hours of summer community service. United Talent Agency's multi-faceted approach to philanthropy---including volunteerism, in-kind donations and financial support--reflects both the agency's belief in good corporate citizenship and a company-wide responsibility to better the community around it. The 501(c)3 non-profit UTA Foundation channels the agency's goodwill and resources into action, such as mentoring youth, addressing hunger in our nation, supporting our veterans, building homes for low income families, and restoring our natural resources. The mission of the WME Entertainment's foundation is to enhance the lives of children and families by promoting the arts and improving education for disadvantaged students. In reaching this goal, WME offers grant funding to nonprofits throughout America that present arts and education services to underprivileged children. In addition to those, WME provides capacity building grants in order to promote effectiveness and sustainability within an organization's leadership. WME also encourages employee involvement in the community through in-house charity drives and volunteer activities at places like the Los Angeles Food Bank and Shriners Hospital for Children. For more than 80 years, Warner Bros. has maintained a tradition of exceptional corporate citizenship, and partnering with nonprofit organizations through employee donations and volunteerism are cornerstones of our community outreach initiatives. Our priority areas for philanthropy and community involvement are Youth Enrichment, Community Engagement, Environmental Sustainability, and Global Outreach. © 2012 Entertainment Industry Foundation. iParticipate is an initiative of the Entertainment Industry Foundation. EIF meets all 20 BBB Charity Standards.